Directions: As you come through the village towards the harbour, the Hall is just past the Church on the left hand side. Susie Green, Tom Trevelyan, Susan Taylor, John McCann, Basil Taylor, Philip Edwards present. 1. Minutes of last meeting 28th January were accepted. 2. Matters arising. Sec has not written to the neighbours about that tree as we are talking to them and it can be mentioned therein. The precis of the notes on residents questions to be converted to FAQs by Sec and posted. The future Chair will be Philip Edwards. A new trustee who can take over bookings and invoices is needed, plus another, hopefully younger. Some names put forward, to be followed up by PE and ST.
3. Project. CDC has sent the conditions for permitting planning permission. They have been reviewed by PG and the prospective contractor and CDC have been informed they are acceptable. They cover pre-approval of the drainage scheme, execution thereof, and protection of trees and shrubs during construction. Demolition no to start till the usual CEMP has been submitted. A ground, floor and path levels plan to be submitted. The hedging has been received and will be planted within a week. The site boundaries have been scaled from the plan and marked out on the ground. J McC is arranging the work party. Discussion of the necessity of the building to be warm, as we have lost several long term bookings because of the cold. PG is researching possible improvements to the flooring and the ceiling. Easily controllable electric, possibly off peak systems are the likely solution as they are flexible and of low capital cost. The lease of the car park from JH & FW Green Ltd at a peppercorn rent is in hand. 4. Fundraising. PE laid out plans and the names of the fundraising committee. Preliminary work to be finished by the AGM on 12 May and contacts with possible donors from 1st June. A full village address list is required. There may be a hog roast or BBQ event in this summer, maybe 6 July.Some watercolour type images for the necessary communications were tabled. A little more work to be done. BT reported on a possible VAT relief scheme in this year’s Finance Act, to be followed up. DEFRA has schemes for village halls. CDC has grants. Next meetings. AGM 12th May, 31st May 2019, 26th July, 27th September, 29th November. Susie Green, Tom Trevelyan, Susan Taylor, John McCann, Basil Taylor, John Hustler, Philip Edwards present. 1. Minutes of last meeting 23rd November and 10th December were accepted. 2. Matters arising. The ash tree on the other side of the ditch on our north eastern corner is half dead and half rotten. It is on land belonging to neighbours. Sec to write to them asking that it be made safe, which will mean being cut down. A precis of the notes on residents questions to be posted on the website, as the last page of these minutes. The full text to the people themselves. Car park. No change in our management for now. 3. Project. The CDC planning committee met on 16th January and heard the officers statements, our representations and those of two objectors. The committee decided to PERMIT, with the conditions suggested. Written confirmation is expected by 15 Feb.
New Car Park hedging. Agreed we will plant in the regulatory window before the end of March. Subsequently an offer from the Conservancy to supply the plants for £500 has been received and will be accepted. Engage A Grant, the retired quantity surveyor, pro bono to fulfill the QS role in the contract. Treasurer to pursue studies of the possibility of VAT relief contained in the current Finance Act. Patrick Green agreed to lead the construction contract and works. Many thanks were expressed. 4. Fundraising. A fundraising subcommittee to be set up. Philip Edwards agreed to be the initial chair. To raise sufficient for the car park and begin that first. Planning deadline for starting work 14.1.22. A formal letter template using the red letterhead to be created by TT, and a draft thanks to donors by PE. 5. Trustees. Susie Green will resign at the AGM. The remaining trustees will stand again. Candidates for Chair and ordinary trustee considered. SG, PE and TT have names to approach. To be reviewed at next meeting. 1. Minutes of last meeting accepted. 2. Matters arising. The tree survey has not been commissioned yet due to expense - the quote was £600. Conversations with the owners of Churchgate about the ownership of the lane were had. SG mentioned the dead ash tree was on the other bank, nearest to Churchgate, which we regard as being on their side. We will include that tree when we get any quote for tree work. The Churchgate owners asked to see the quote before work began. No further information on the person replacing Richard Shrubb as Chair of the Woodger Trust during his illness is currently available. 3. Project Report. A letter had been received from the planning department at CDC that they were minded to recommend refusal of our application under delegated powers, as under the relevant planning policies a change of use for the car park area from agricultural was not justified. Study of those policies, namely 2, 43, 45 and 48 of their CLP policies suggests there are grounds for more favourable interpretations. Neither had the Harbour Conservancy’s response recommending No Objection been received when the planning officer’s refusal intention letter was sent. Representations were therefore made on those lines, and our District Councillors were asked by Hall Trustees and the chair of the Parish Council to red card the application if it looks to be rejected so that it goes to the full Committee. Should the planners continue their recommendation to reject, and the red card fail, we will attempt to withdraw the application. The outcome is awaited. Noise is not a planning issue. We have two incidents where a child was restrained to prevent a car hitting them. JMcC, AS.At committee, the more supporters the better. Pre-committee trustee meeting 6pm Monday 10th December. 4. Management, and Noise. Members had previously read the emails received from 2 residents on the subject of management and noise. They were read out to the trustees with comments as to accuracy and relevance. The Noise Act 1996, and CDC’s Environmental Health Noise policies are relevant, and lay down that noise between 2300 and 0700 is controlled, and by what method and by how much. A decision was taken to bring forward the end of hire time to 2300, with music ceasing by 2230. This will be reflected in our hire agreement, effective immediately. It was noted that no substantiated complaints about noise had been brought by the Environmental Health team in the last 4 years. Records from further back had not been examined. We are guided by the law and the requirements of the Council’s Environmental Health Department. Following requests from neighbours to limit the number of events (previously no limit) and discussion at the 2017 AGM, the trustees noted that the maximum annual number of evening events was set at 8 at the Trustees Meeting July 28th 2017, of which perhaps 6 might involve music till 23:30, now to be 22:30. Trustees confirmed that the development project will be funded by donations and grants and will not require any increase in income from hirings. Current levels will be maintained. It was agreed that trustees should see all communications from residents and relevant ones from hirers or other bodies. Replies to be agreed by all. A decision was taken to make future meeting minutes available on our website. A decision was taken to develop an email newsletter using MailChimp or similar. The website was reported as having been improved and updated recently. The Hon Sec to approach a suitably qualified resident to cost and help implement these items. An method of easy trustee communication was agreed. It was proposed that evening events be attended at beginning and end by a trustee to ensure compliance. Postponed to the next meeting as time was not available. 5. Fundraising. PE suggested we hold a BBQ aimed at families and children next year and outlined it. To be a joint event between us, the Church, and the Itchenor Society. Saturday June 1st is the date. Thanks were expressed to PE for continuing fundraising ideas and organisation. 6. Treasurer. Treasurer tabled current financial figures which were satisfactory. A letter is awaited from HSBC confirming our balance at year end, to enable the sign-off of last year’s accounts by our independent examiner. It has not appeared despite numerous reminders over 6 months. The treasurer was authorised to finalise the accounts without it. 7. AOB. Unauthorised use of the car park by residents and non residents was discussed. Due to time restraints no decision was taken. For next meeting. 8. Next meetings. 6pm 25th January 2019, 29th March 2019, 31st May 2019, 26th July. MINUTES OF TRUSTEE MEETING 10TH DECEMBER 2018. All the quoted planning policies were considered. Chris Cook our architect was appointed to discuss each of them with the committee. Al Spencer to speak as the WIPC underlining the importance of the project for the residents. J Talbot to be asked to speak as a long term resident. Susan T to approach PCC for a letter describing how the church needs and uses the Hall. We are interdependent. The meeting starts at 0930 on the 16th January 2019. 4. Resident’s letter. A letter from a resident was considered. Philip E described his understanding of the background. He and Tom T were delegated to prepare a response for posting on the website. 8. Next meetings. 6pm on 25th January 2019, 29th March 2019, 31st May 2019, 26th July. The land for the Itchenor Memorial Hall was given to the village after the 2nd World War, to commemorate and honour the young people who gave their lives during the wars. After admirably serving the community for over 65 years, it is in need of refurbishment. Planning permission was granted in January 2019 to enable the hall to be modernised while continuing to honour its legacy and the past. Our vision is to enhance the space so that classes can run in comfortable surroundings concurrently and users are in a space that is well lit and warm and are able to enjoy the wonderful views of the woodlands to their best advantage. In order to do this we propose a new car park (same car spaces as now ) to provide safer parking and adding 3 new disabled car spaces. This will be on the north west side of the hall with a new entrance from the carpark. 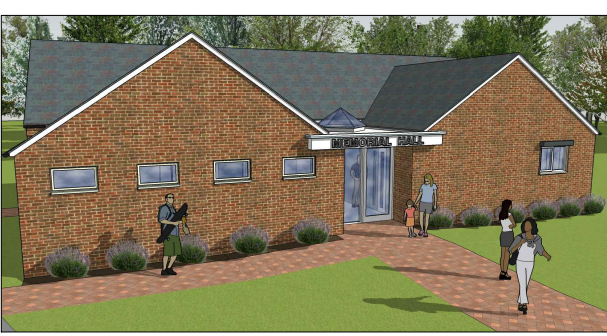 The plan for the hall is to add a new small meeting room and move and upgrade toilet and kitchen facilities. See our drawings and plans below. Any body who is interested in helping with fundraising please contact us on itchenormemorialhall@gmail.com or speak to one of the Trustees. We will be running work parties to do much of the landscaping and preparation of the site and would welcome any and all of you to help us in this .John McCann will be co ordinating and if you would like to know more please contact John on the Memorial Hall email below.